Aimed at community planners, emergency managers, and other coastal zone decision-makers this video will explain how using geospatial information already available through NOAA, combined with strategic local investments in infrastructure can provide communities with the data needed to confidently plan for future sea-level changes. I think this is going to be very helpful in helping us determine what is happening with our coastlines. 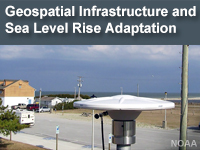 Understand how geospatial infrastructure can help to inform adaptation strategies to address problems caused by coastal flooding and sea level rise.